Packing lunches for young athletes can be a challenge. As a parent of a future “Hall-of-Famer”, you’re inevitably bouncing from practices to games to snack duty to shopping for sports gear to EVERYTHING ELSE you do as a parent. Athletes have different dietary needs than the typical child so finding time to pack a nutritionally complete lunch can be difficult. Preparing lunch the night before and packing a meal complete with protein, healthy fats, and complex carbs will keep your athlete energized throughout the day as they balance classes and sports practice. 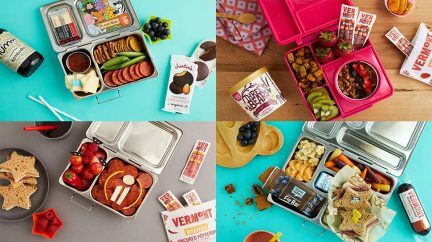 We pulled together 3 nutritionally-complete lunchboxes with your superstar in mind. What’s the best part about a snack lunch? It’s super speedy! We’re not kidding, this “snack lunch” took us under 2 minutes to put together. With thoughtfully chosen snacks, you can save time and still meet all of your athlete’s nutritional needs. We included Bare Snack’s brand- new sea salt sweet potato veggie chips and fresh sweet peppers for complex, veggie-based carbs, to dip in Lantana’s delicious (especially if your athlete likes a kick) Sriracha Carrot Hummus. We packed Cabot Singles to include some healthy fats and our Original Minis for added protein. Lastly, we added Health Warrior’s DELICIOUS (low in sugar) Chia Bars for a healthy dessert. As mentioned earlier, it is SO important that packed lunches include extra snacks for your athletes and this lunchbox is chock full of healthy snacking options. This lunch is surprisingly simple and packed with all the healthy fat, protein, and carbs necessary to keep your athlete’s energy level consistent throughout the day. The core of this meal is a simple caprese sandwich on a sourdough baguette, slathered with basil pesto and stacked with mixed greens, fresh mozzarella, and tomato. We added a side of mixed greens tossed with this homemade dressing, but if you want to speed things up a bit, any premade dressing works! We recommend NOT using reduced-fat dressings, but rather a dressing with healthy fats such as avocado oil or olive oil. Especially if you have an endurance athlete (long distance runner, swimmer, etc) it is SO important to include healthy fats in their meals. While low-intensity, shorter exercise is fueled mainly by carbohydrates, endurance activities are primarily fueled by fats. 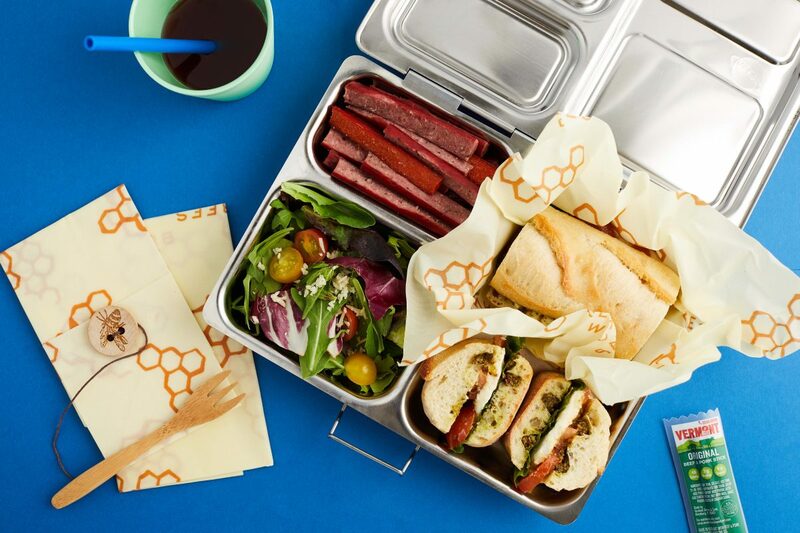 We packed this lunchbox with plenty of Original Mini Meat Beef & Pork Sticks. Student athletes not only need a nourishing lunch, but they also need plenty of snacks to keep them moving after school, when most school sports occur. Most athletes won’t have time to stop home or find a snack before after-school sports, so packing easy snacks, high in protein and healthy fats, is essential. 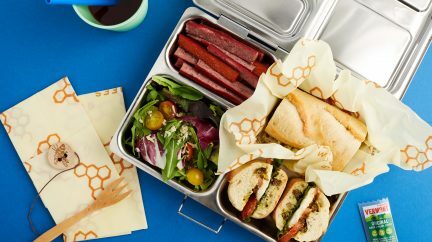 Beyond checking off all the boxes nutritionally, we’ve used our favorite reusable lunchbox Planetbox and Bee’s Wrap (reusable faux plastic wrap) to create a practically 0 waste lunch. Last but not least, this whole-grain pasta salad is just as delicious as it is nutritious. We used whole grain rotini, dressed with fresh basil pesto, tossed with quartered grape tomatoes and parmesan, and garnished with fresh basil. It’s so easy to make a big batch of this pasta salad to use for lunches and sides throughout the week. We also added some fresh veggies and granny smith apples (perfect paired with Justin’s Classic Almond Butter.) 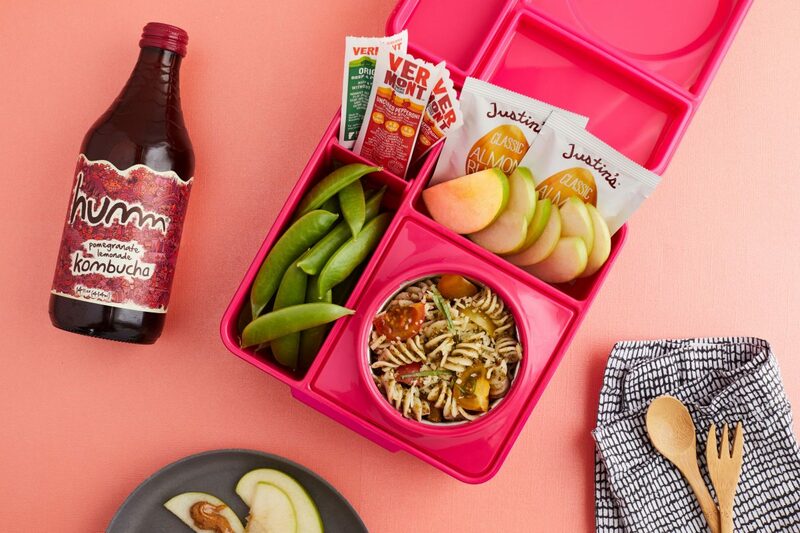 We packed our BBQ, Pepperoni, & Original Mini Beef and Pork sticks for added sustenance throughout the day and added in a DELICIOUS bottle of Humm Pomegrante Lemonade Kombucha. 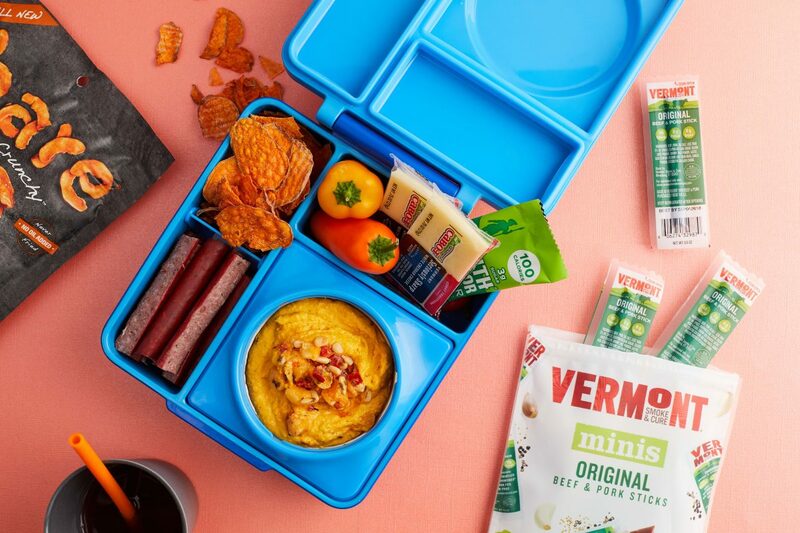 The KEY to packing a lunchbox that will meet all of your athlete’s nutritional needs is including healthy fat, protein, carbs, and veggies/fruits that will provide them with the nutrients and minerals they need. And most importantly, make sure to always send your athletes off with a reusable water bottle to keep them hydrated all day! Join our newsletter to get updates on everything Vermont Smoke & Cure. Thank you for joining the Vermont Smoke and Cure mailing list! We look forward to sending you special offers, new product announcements, the occasional recipe and the scoop on our Vermont suppliers. Oval 1 Copy Created with Sketch.